allaboutedie: Which do you choose?.... Faux or Real? Which do you choose?.... Faux or Real? Fur fur fur...... Fake or real? Fur was all over the Autumn runway shows, in all different forms. We have seen red fur, green fur, full fur outfits and lots of fur details, both natural and fake. Karl Lagerfeld went all out in the Chanel show, with fur house classic tweeds and quilted coats, chained strapped bags and boot trimmed in fur and PETA doesn't have anything to worry about because the fashion genius uses fake fur. Everybody has a different opinion on the infamous topic, and that is fine. I have friends that have different opinions on whether to go fake or real - One will only buy that soft, warm vest if it is real. (just yesterday he brought a deep red squirrel neck shrug, because he just couldn't resist.) Then on the other hand there is my friend who will not even touch real fur, it makes her feel physically sick. 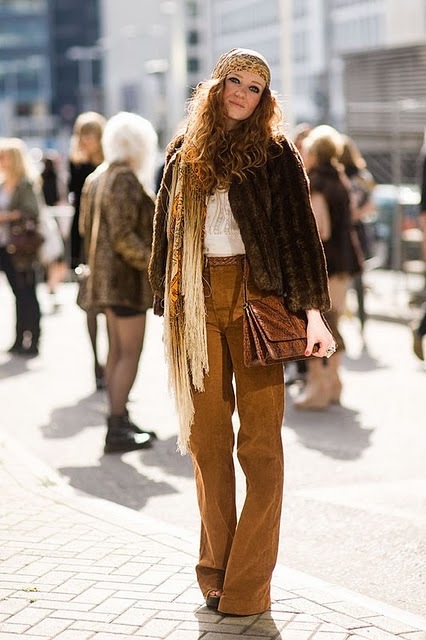 She’s even threatened to burn a (real) vintage fur chocolate coat that was left at her house because it repulsed her. 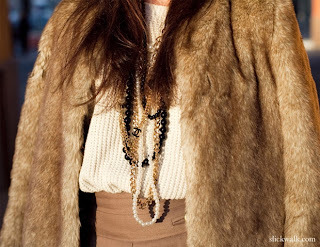 Both Artificial and real fur look chic and beautiful and is perfect to keep you warm when the chilly season approaches. Anyway, the point is everybody has their own varied opinion on what type of fur they lust over, but one thing we all know is fur is still a strong autumn/winter trend.... faux or real!﻿ So, sit back and relax and check out these inspirational images taken on the streets of New York, during New York fashion week......I can't wait to be there one day.